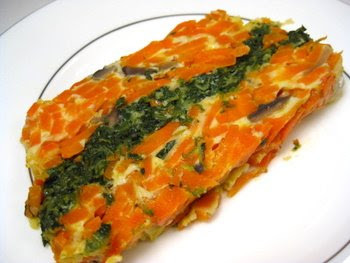 Have you ever bought those vegetable pates and been disappointed to discover how vile they are? They’re really an insipid excuse for food and I refuse to buy them again. This is quite the contrary, I assure you. This recipe has such a sweet and buttery flavor, you’ll be making this not only when your vegetarian friends are on the guest list, but for everyone who loves good food. I made this for a reception yesterday and the plate was practically licked clean. The recipe comes from my friend Dede, one of “le matte,” my Italian chit-chat group. It’s originally a Wolfgang Puck recipe from his book “Modern French Cooking for the American Kitchen.” I changed it to use frozen spinach instead of fresh and used Jarlsberg cheese instead of the Gruyere, since that’s what I had on hand. It can be served warm or at room temperature, but if you try to serve it right out of the oven, it won’t hold together very well. Give it at least 15 minutes to rest. Start out by buttering a 8 1/2 by 4 1/2 by 2 1/2 inch loaf pan. 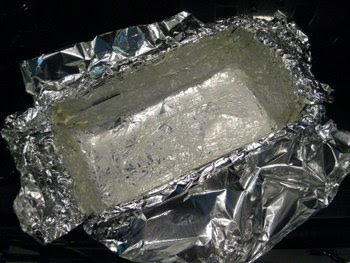 Then line the pan with aluminum foil and butter the aluminum foil. 1. Melt 1/2 stick of butter in a large skillet over medium heat. Add the carrots and saute’ slowly until tender, about 25 minutes. Chop coarsely and remove to a bowl. 2. Increase heat to high and melt 1 T. of butter. Add the mushrooms and saute’ for a couple of minutes. 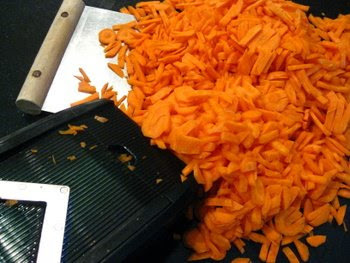 Chop coarsely and add to carrots. Set aside. 3. Melt 1/2 stick of butter over medium high heat in a skillet, add the spinach and saute a couple of minutes. 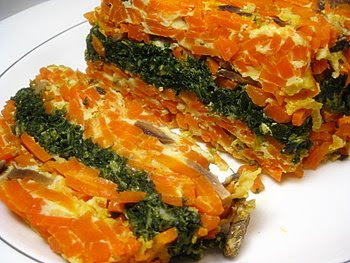 Chop coarsely and place in a separate bowl. 4. Beat together the eggs, cheese, salt and pepper in a medium bowl. Add about 2/3rds of the egg mixture to the carrot mixture and mix well. Add the remaining egg mixture to the spinach and mix well. 5. 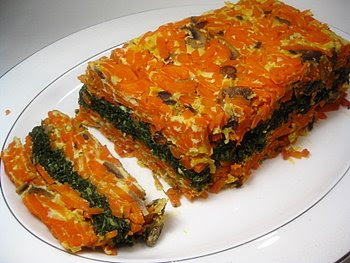 Spread half the carrot mixture over the bottom of the pan, cover with the spinach mixture and top with the remaining carrot mixture. 6. Preheat oven to 400 degrees. Cover the loaf pan loosely with foil and place in a roasting pan. Add enough boiling water to come halfway up the sides of the loaf pan. 7. Bake about 1 hour 15 minutes or until a knife plunged into the center comes out clean. 8. Uncover, invert the loaf onto a serving platter and remove foil. 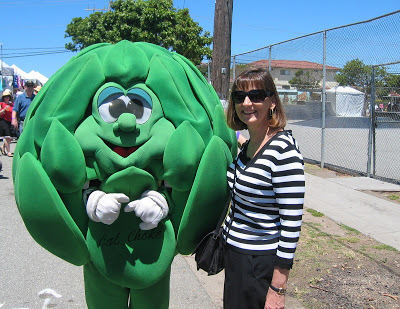 I never ate an artichoke until I was in my 20s. Boy have I made up for my errant youth. 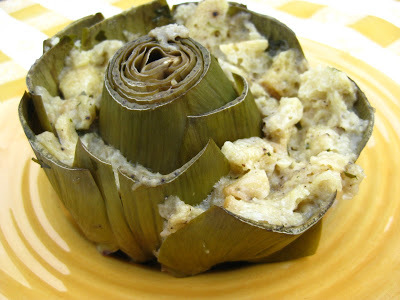 I love artichokes in all forms – tender marinated artichoke hearts in salads, warm and baked in a lasagna oozing with bechamel and parmesan and whole ones squished and fried as crispy as potato chips the way Romans eat them. Those are called “carciofi alla giudia” or “artichokes Jewish-style.” I once tried duplicating them at home, but my version was about as tasty as fried cardboard. I guess I’ll have to go back to Rome to properly enjoy them. My mother-in-law introduced me to artichokes. 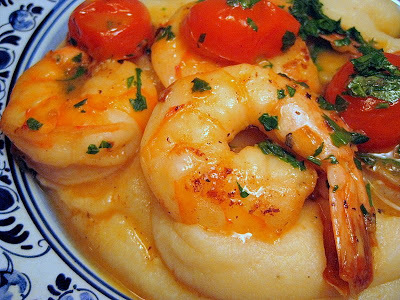 She had a very narrow repertoire of dishes, but they were all delicious. In her case, less was more, since in limiting her range of offerings, she could make them practically blindfolded. One of her specialties was stuffed artichokes. Naturally, there was no recipe involved, so I had to pay attention while she prepared them. Over the years, I’ve made them dozens and dozens of times and if you don’t get the proportions exactly alike each time, it’s no big deal. Trim the artichokes by slicing off the stem so it can stand upright in a pot. Then peel off the bottom-most leaves. Trim across all the pointy parts on the remaining leaves with a scissors or a knife, slicing off the topmost circle of leaves to make them level. If you want to, scoop out the choke in the center using a grapefruit spoon. But even if you leave the fuzzy choke inside, it will be ok. You wouldn’t want to eat it, but it will soften during cooking and you’ll be able to scrape it off and eat just the heart. With a fork, beat the egg in a bowl, and add the bread, cheese, parsley, garlic, salt and pepper. Mix in a little water until the mixture starts to stick together. Start out with just a little water at a time, maybe 1/8 cup or so. You don’t want the mixture to be sopping wet, but it shouldn’t be dry either and it should stick together. 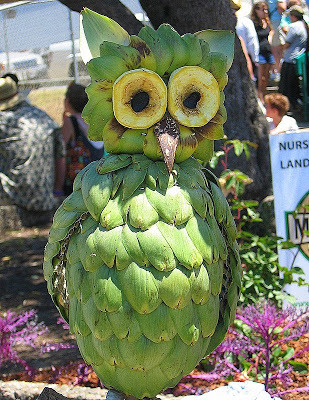 When you reach the right consistency, stuff in between the artichoke leaves. Place in a pot with some water, or chicken broth, or water with a chicken bouillon cube. Drizzle with a little olive oil. Bring to a simmer and let the artichokes cook for about two hours with the lid on. Keep checking to make sure all the water doesn’t evaporate. After a couple of hours, test one of the leaves. If it’s not fork-tender, cook another 1/2 hour or until done. 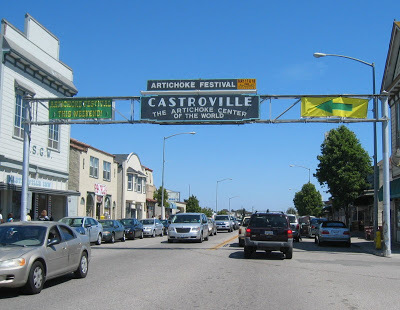 If you find yourself in central California this May 16th or 17th, try to get to the Artichoke Festival in Castroville, known as the artichoke capital of the world. Marilyn Monroe was crowned the first Miss Artichoke Queen there in 1947. There are lots of exhibits, artichoke samplings, wine-tastings and plenty of other entertainment too. For more information on the festival, click here. I wouldn’t make a special trip, but if you’re in the area, it’s worth a day trip. Last year, following a wedding we attended in Carmel, we drove to the festival and had lots of fun. 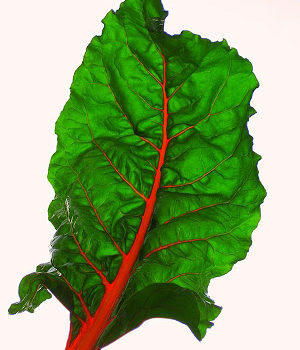 Swiss Chard – It’s known as “The Queen of Greens” and for good reason. 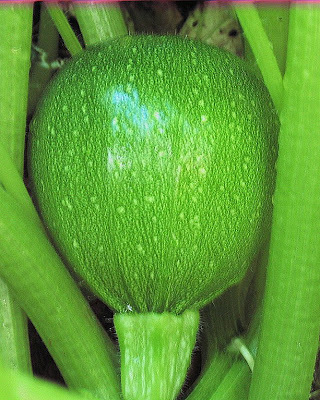 It’s packed with valuable nutrients and a flavor that delivers – something like spinach but punchier. Growing up in an Italian household, it was not unusual to eat it cooked with a little olive oil, garlic and a dash of red hot pepper flakes. 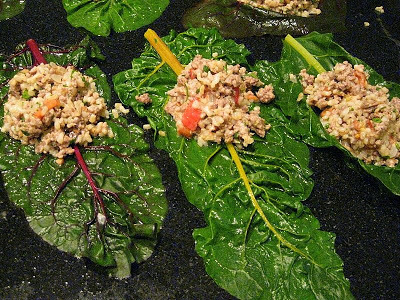 I still love to prepare it that way, but when I find myself with an abundance of the crinkly green leaves, like the one in the picture, I can’t resist stuffing them with ground meat and brown rice and stashing them in the freezer for those days when I don’t have time or inclination to cook. 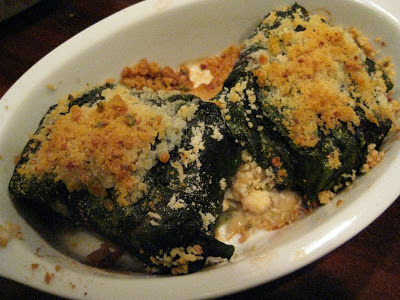 I have served them with a bread crumb/parmesan cheese topping or smothered in tomato sauce. Either way, this recipe has a way of winning over any skeptics who’ve never tried this relative of the beet family. meat entirely if you want to go strictly vegetarian. 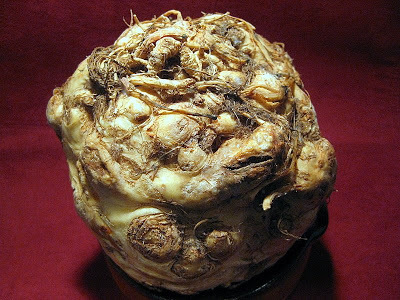 For this recipe I chop off the thick stalks and use them separately in other recipes – soups or gratineed in a casserole. It’s like getting two vegetables for the price of one. Make this ahead of time and let it cool. Start by bringing a large pot of water to boil. Cut off the stalks of the swiss chard and cook them in the boiling water for about two or three minutes. The point is to make them pliable enough to stuff easily. Drain and run cold water over the leaves to stop the cooking and to make them easier to work with. Saute the chopped onion in the olive oil until translucent, then add the meat and saute until cooked through. Drain off any remaining water or oil and put into a large bowl. Saute the mushrooms until cooked, then add them to the bowl, along with the diced tomatoes, parsley and salt and pepper to taste. Add the cooled rice to the bowl, then the beaten eggs and mix everything well. Dry the swiss chard leaves a little, and lay them out on a counter top. Place about 1/4 cup of stuffing on each leaf, then start rolling up the leaves from the stalk end, folding in the sides as you roll. Place in a greased casserole. Top with either a tomato sauce or a mixture of bread crumbs, parmesan cheese and herbs. Bake in preheated 375 degree oven for about 1/2 hour. I’ve stared at that head of cauliflower in the fridge too long. It’s not that I don’t like cauliflower. It’s just that when I bought the monstrous thing two weeks ago at a farmer’s market, it was enough to serve the whole neighborhood. We just can’t eat it fast enough. I’ve made side dishes with it several times, but since it was as large as a soccer ball to begin with, I still had half of it begging me to come up with some other ideas. And a few brown spots were starting to appear, so the time had come to get serious. What to do, what to do? A soup came to mind, especially since the weather had taken a turn to remind us that fall is around the corner. This is not a pretty soup to look at. It’s a rather dull-looking monochromatic exercise in brown and beige. I could have made it a white soup, had I not browned the cauliflower in olive oil first. But that step gives the soup more taste. 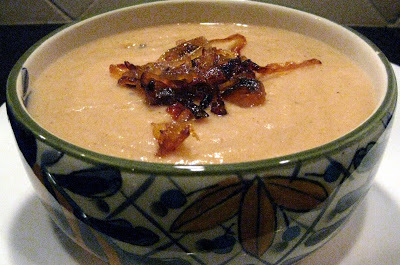 And the taste, especially those caramelized onions resting on top, makes up for the homely appearance of this soup. DO NOT scrimp on the time needed to cook the onions. They really need the full 20 to 30 minutes to achieve that sweet and crunchy flavor. And if you’re like me, you’ll probably be wishing you had a secret stash of those caramelized onions for an extra serving. Start by peeling one large onion, slicing it, and cooking it in 1/4 cup of olive oil in a saute pan. Keep cooking and stirring for at least 20 minutes while the soup is simmering. Saute the onion and garlic in the olive oil until translucent. Add the cauliflower and continue cooking the florets for about 10 minutes, or until they are partially browned. Add the potato, chicken stock and salt and pepper to taste. The first time I made this, I under-salted and over-peppered. My husband loved the piquancy, but I drank an entire large bottle of San Pellegrino before the heat in my mouth was tempered. To be on the safe side, try making it with about 1/2 teaspoon of salt and 1/8 teaspoon of pepper. 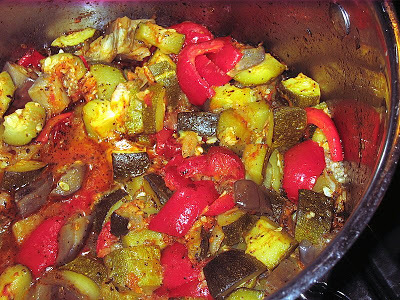 Simmer for about 20 minutes or until vegetables are cooked. Finish by pureeing in a blender or with an immersion stick blender. Ladle into bowls and add the caramelized onions on top. Today was one of those top 10 weather days in the Northeast U.S., so off I went to the tow path that traverses a nearby lake and canal in my town. No radios or tvs to remind me of the financial morass or the political hyperbole that has been omnipresent in the U.S. Just me and my bike and peaceful waterside scenes of ducks paddling by, muscular young men and women jogging by and long, sleek collegiate racing sculls with oarsmen gliding by. Before I knew it, it was nearly dinner time and I wanted something quick. Chicken breasts were already thawed, so they could be easily grilled. But what to accompany them? Potatoes? no, too much time. Besides, I had none in the house. But I did have rice, and a risotto would take only 20 minutes. I could add some of those herbs growing in my garden too, similar to a risotto I had eaten earlier this summer with friends at their home in Italy’s Val D’Aosta region. That night we dined in their restored, 17th century house overlooking a castle that Disney might have designed, had he been alive in the 11th century, and the distant peaks of Monte Bianco, Europe’s tallest mountain. 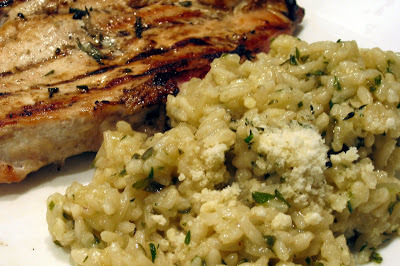 I’m not exactly sure which herbs my friend Marisa used in her risotto, but it doesn’t really matter. Use whatever you have on hand. 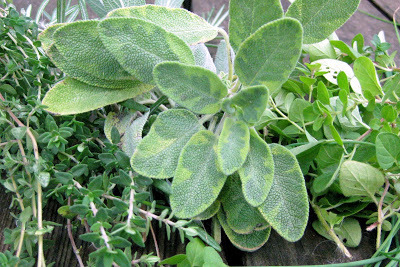 And it can be only one or two herbs, rather than the mixture I used — a combination of fresh thyme, oregano, chives and sage. Whatever you choose, make sure they’re fresh, not dried herbs. With the addition of a salad and the grilled chicken, dinner was ready in a half-hour and I had gotten in my exercise for the day too. It might not have been the Val D’Aosta, but my bike ride — and my risotto — were pretty special too. Pour the olive oil into the pan and add the shallots or onion and garlic. Saute until translucent. Add the rice and stir for a couple of minutes to coat with the olive oil. Add the white wine and let it reduce until it’s almost gone. Start adding the chicken broth, a ladle at a time, stirring and letting it cook down until it reduces. Add salt and pepper, being careful to add only a little salt. The parmesan cheese that you later add will contribute to the salty taste. Keep adding more chicken broth, a little at a time, until the rice starts to become more tender to the bite. If you find yourself running out of chicken stock, keep the tea kettle boiling and use hot water. 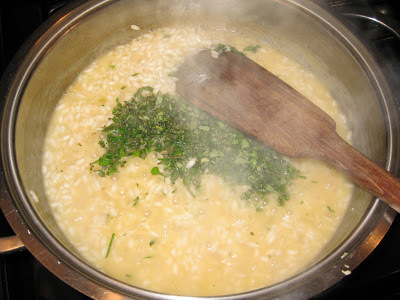 Add the herbs after about 15 or twenty minutes, when the risotto is nearly done. If you add them too soon, they’ll darken and you’ll lose some of the flavor. Stir for a few more minutes and then add the butter. Remove from the heat and add parmesan cheese – anywhere from 1/4 cup to 1/2 cup, depending on your taste. So many of my friends are good cooks, including Lilli, who originally hails from Salerno, about 30 miles south of Naples. She made the potato cake in the photo and gave it to me shortly before dinner tonight. Boy, was I lucky to be in the right place at the right time. It’s the ultimate comfort food all’Italiana. Think of mashed potatoes all dressed up and ready to show off. It’s also a terrific party food too, to make ahead and bake later. 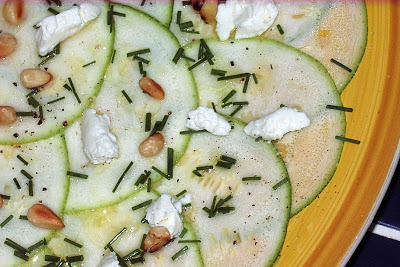 There are as many variations of this recipe as there are varieties of pizza. Some recipes call for adding bits of salami, some for ham, and some for both — but you can omit the meat entirely if you like. You can also add provolone cheese in addition to the mozzarella, or pecorino instead of parmigiana. Like so many Italian cooks I know, Lilli keeps a lot recipes in her head, including this one. She did, however, spell out the basic ingredients, and I have approximated proportions in the recipe that follows. The gatto’ (accent on the second syllable) is a traditional Neapolitan recipe that takes its name from the French “gateau” or cake. If you make the mistake of accenting the first syllable, you’ve got yourself a potato cat, not a potato cake. Boil potatoes until tender and drain. Place the 4 T. butter into a bowl. Peel the potatoes and pass through a “ricer” or mash by hand directly into the bowl over the butter, so that the hot potatoes melt the butter. Cool for five minutes, then add the rest of the ingredients except the bread crumbs and the 2 T. butter. Mix it all together until blended. Grease the bottom of a pie plate or other oven-proof dish with butter and smooth the mixture into the container. 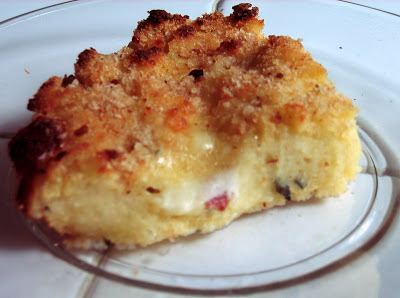 Sprinkle bread crumbs on top and gently press down with a fork. Dab with bits of butter. Bake in a preheated 375 degree oven for about 45 minutes.